In 2016, Eddie is fully grown, and thinks he's put his past behind him. But then he gets a letter in the mail, containing a single chalk stick figure. When it turns out his other friends got the same messages, they think it could be a prank... until one of them turns up dead. That's when Eddie realizes that saving himself means finally figuring out what really happened all those years ago. This book has been on my radar ever since I saw Stephen King's tweet recommending this book. I really enjoyed this debut, and I would definitely read more from this author. The prologue starts off very creepy, with an unnamed person finding a girl's head on a pile of leaves and putting it in a bag that already contained pieces of chalk. The police find the dismembered body of the girl, but not the head. The story is told from the point of view of Eddie, with the timeline moving from the present day (2016) to the past (1986). One of Eddie's childhood friends comes back into his life after 30 years, and he tells Eddie that he wants to write a book about the tragedy that happened back in 1986 when the kids were 12 years old. They get together one evening at Eddie's house, but his friend never makes it back to the hotel. His body is found in the river. 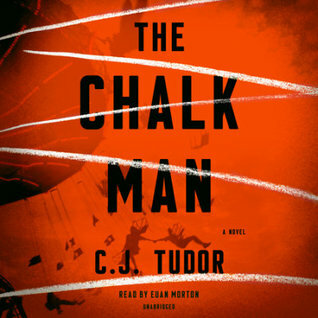 Tudor unravels the past while simultaneously doling out pieces in the present to connect the two time periods. There is much more going on than first meets the eye, and it seems like every person has a dark side! 4 stars!! It was really good, and you should put it on your TBR if you enjoy mysteries. 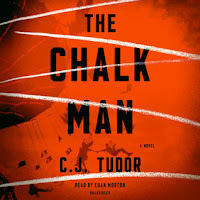 Thanks again to Penguin Random House Audio for the opportunity to review this audiobook!